The AKAI MPC is the heart and soul of the Hip Hop sound. 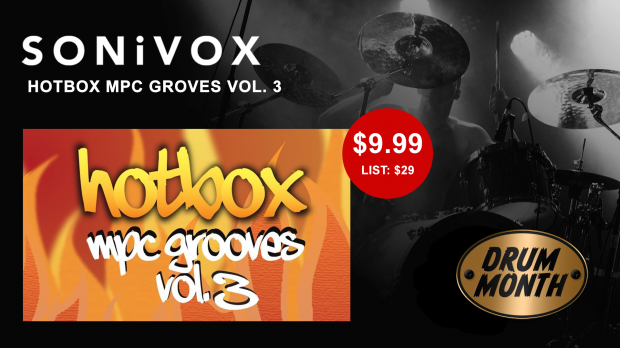 The Hotbox MPC Grooves Vol 3 MPC features over 175 world-class Hip-Hop drum loops. During Drum Month this amazing library on promo at over 65% off. Get inspired with over 175 world-class Hip-Hop drum loops and “enhancing elements”. From dirty lo-fi to hi-tech to modernized classics, this collection has the power and versatility for serious Hip-Hip production. This entry was posted in DontCrack, Promotions, Sounds and tagged Akai MPC, dirty lo-fi drum loops, Hip-Hop drum loops, Hip-Hop production, Hotbox MPC Grooves Vol 3, MPC Loops, SONiVOX. Bookmark the permalink.